How many kids get to go to black tie events? In Richmond, Saturday night, hundreds, thanks to Theatre IV’s annual charity ball. This event raises money to help share their stage productions with less advantaged families and schools and supports their innovative health programs. 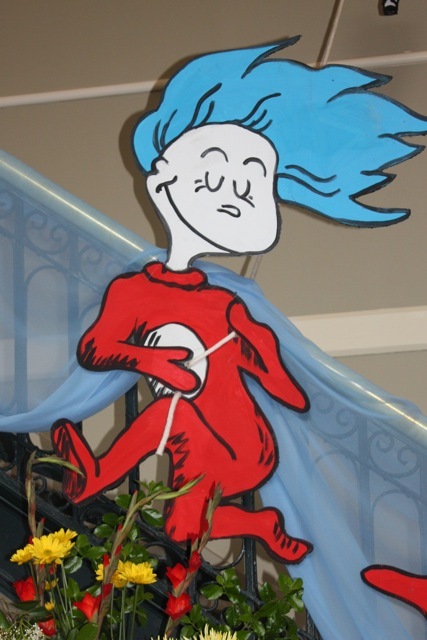 This year’s theme was “The Magical World of Dr. Seuss,” and my family was lucky enough to be part of the fun. As we pulled to up to the curbside valet parking and spotted white tents and, yes, red carpet, my three-year-old daughter’s “Ooooooh” echoed her parents’ sentiments exactly. This was going to be one fancy evening! What we didn’t expect was just how kid-focused it was going to be. Interspersed with fabulous silent and live auction displays were even more attractions for the younger set. An entire “red fish, blue fish” game room featured games with prizes, face painting, and a balloon artist. Backstage, tables were set up with cookies and all the fixings to create decorative sugary goodness. A rehearsal room became a photo studio, complete with a Seussical backdrop and complimentary professional photos. The decorations were plentiful and right from the pages — just what you’d expect if you’ve ever been to a Theatre IV production. And the main stage was, perhaps, the most entertaining. Early in the evening, it was the place to see and be seen, as kids and their parents showed off their best dance moves to the tunes of the very talented band, E3. All sorts of fancy ball gowns and Seuss-inspired costumes made appearances, along with the occasional dad in a tux and Cat in the Hat chapeau, as covers of Led Zeppelin, Jack Johnson, the Steve Miller Band, and others, delighted all musical tastes. Later, the stage filled with characters in full costume, as attendees were treated to a sneak preview of Theatre IV’s upcoming musical, Seussical, and the live auctioneer performed his magic in the spotlight as the night progressed. Food was plentiful, with passed and stationary appetizers and outdoor tents with main-course buffet stations, and three bars served both kid and adult beverages. 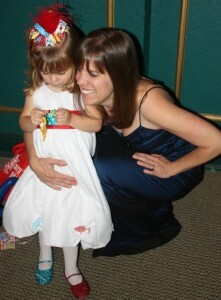 As the evening drew to a close, and my daughter pulled off the ostrich feather hairpiece and glitter shoes that were featured in her “red fish, blue fish” costume, she said, “Maybe tomorrow we can go to another fairytale ball.” A winning endorsement from a three-year-old. It was a blast, and a good cause to boot. Indeed, from there to here, from here to there, Theatre IV’s awesomeness was everywhere.